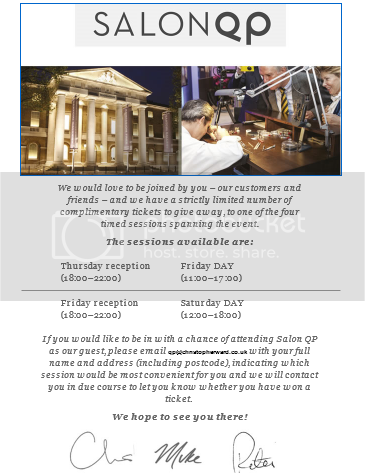 If you would like to be in with a chance of attending Salon QP as our guest, please email qp@christopherward.co.uk with your full name and address (including postcode), indicating which session would be most convenient for you and we will contact you in due course to let you know whether you have won a ticket. For more information about this issue see DSN code 5.7.1 in Exchange Online. I have had the same. There appears to be a problem and CWL are looking into it. Whilst the issue is being resolved the advice is to email directly Helen.McCall@christopherward.co.uk with your details and date/time request. Im at work so that's me out! Problem now rectified, good luck to all who enter the draw - should be a great show. I would have loved to attend but sadly I'm on a Carribean Cruise and Miami stay until the 14th November . I agree...that is very sad for you. ept55 wrote: I would have loved to attend but sadly I'm on a Carribean Cruise and Miami stay until the 14th November . If you want to swap I'm sure we could work something out. Gotta ask. What is SalonQP? The last watch I bought will be the next to last watch I ever buy! Looks to be a cool event. I bought a ticket for Saturday. Anyone else going to be there that day?